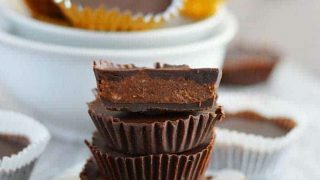 These 3 ingredient Chocolate Hazelnut PaleoNutbutter Cups are so easy to make. 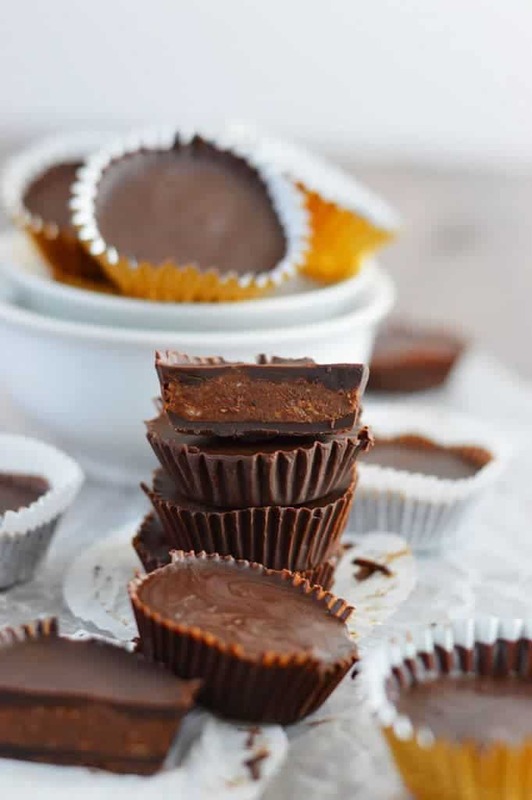 They’re the perfect little bite that’s sweet enough to satisfy those chocolate cravings without the guilt. There is something about chocolate that you guys just can’t get enough of. I’ve noticed a little trend here, I need to post chocolate recipes often to keep you satisfied. Lucky for you, my husband is a chocoholic too. It’s the same exact thing. I need to make something chocolate often enough to keep Adam happy. A guy can only take so many fruity desserts. Mackenzie is the same way. The girl wakes up asking for chocolate. Actually, she first asks “where’s daddy”. And then, “chocate”. For the record, I don’t feed her chocolate for breakfast. Unless it’s double chocolate zucchini bread. Or double chocolate chip muffins… or mint chocolate chia seed pudding. Ok fine, we eat chocolate for breakfast. My bad. 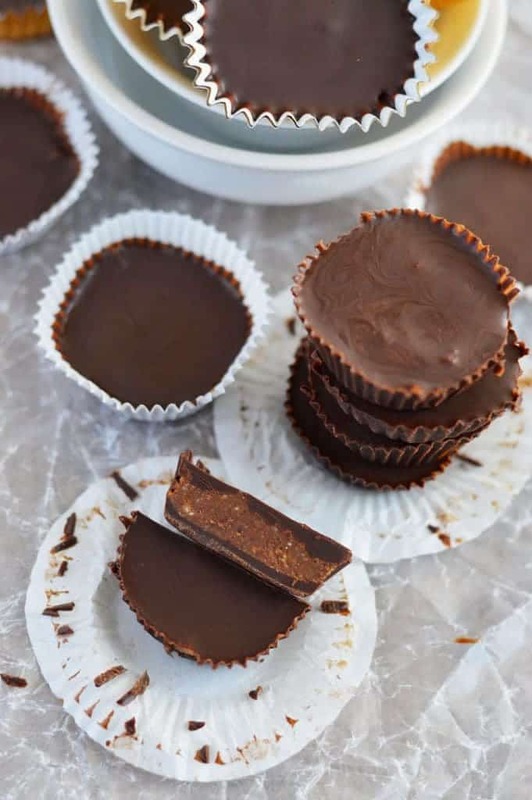 These Chocolate Hazelnut Paleonutbutter Cups are a perfect little chocolate treat that you don’t have to feel too guilty about. 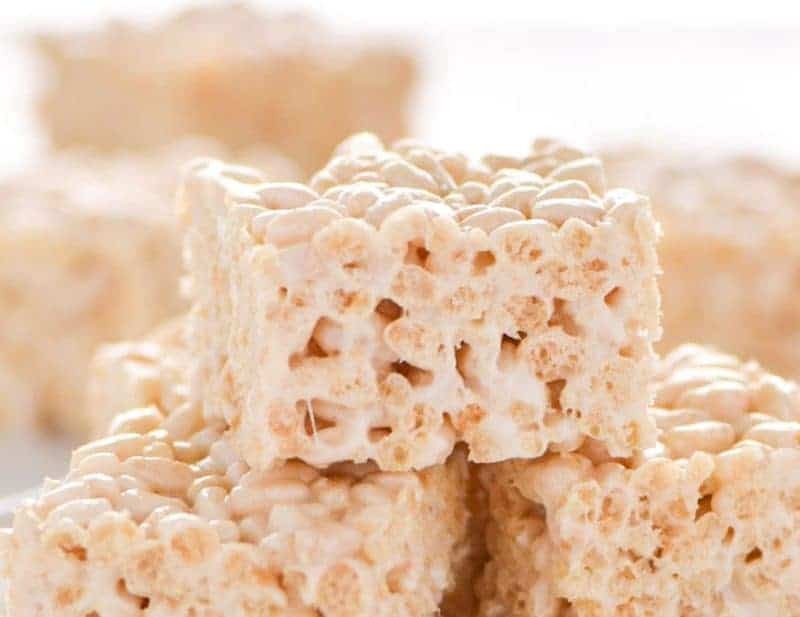 They’re paleo but they’re still sweet enough to satisfy that sweet tooth. They’d also make a great homemade gift during the holidays or for any occasion throughout the year. 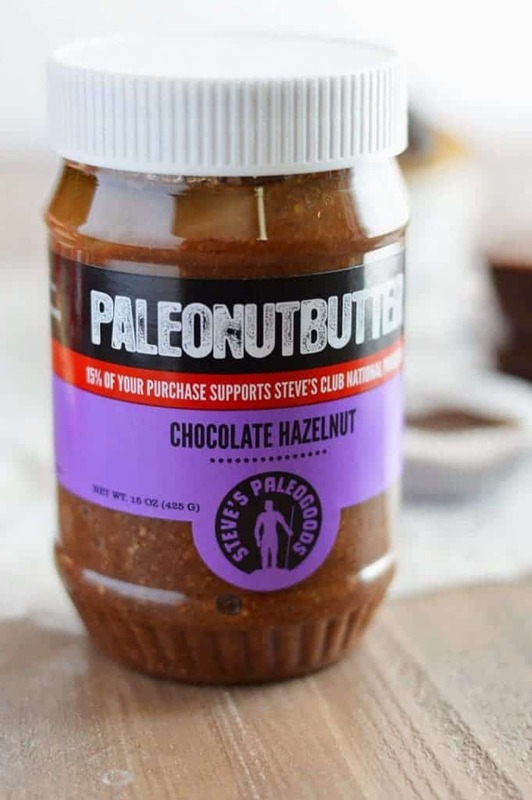 I used Steve’s PaleoGoods Chocolate Hazelnut PaleoNutbutter to make these 3-ingredient treats. 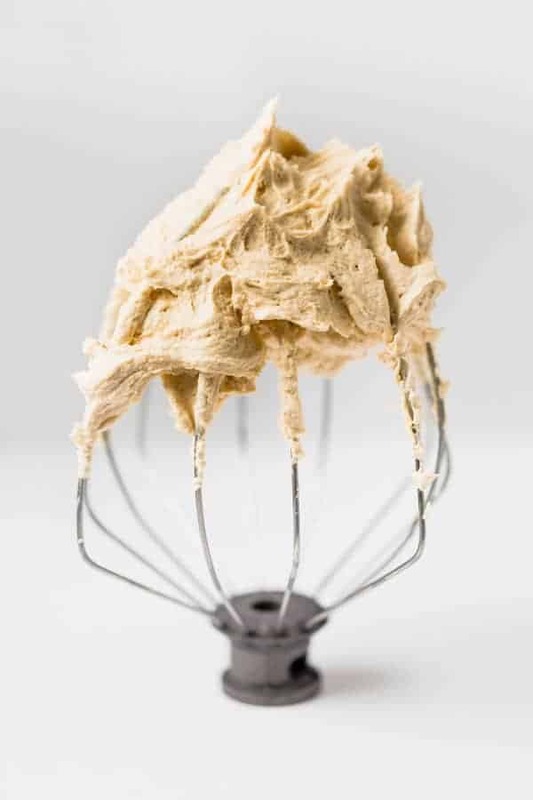 The PaleoNutbutter is the only ingredient in the center making these a super easy no-bake treat anyone can enjoy. You guys, this is the clean version of Nutella and let me tell you, once you try this, you may never go back to the fake stuff. This Chocolate Hazelnut PaleoNutbutter is made with almonds, honey, hazelnuts, unsweetened dark chocolate, coconut oil, and salt. Simple and delicious. I can NOT get enough of this stuff! 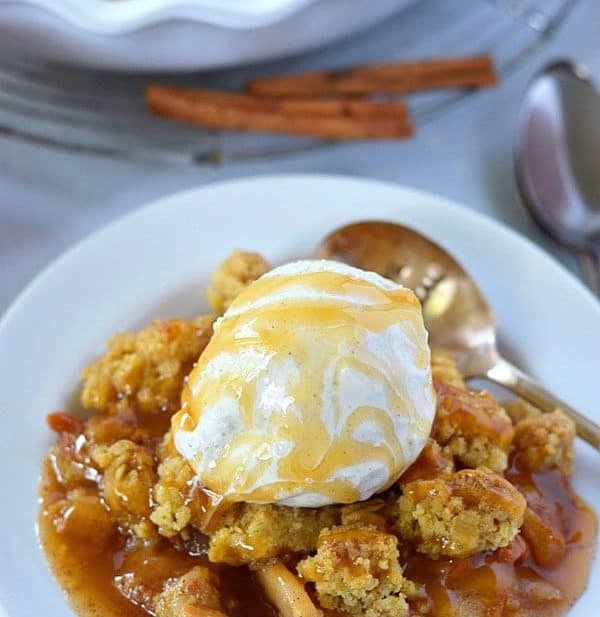 ps this might be a good recipe to have on hand in January ???? Add the chocolate chips and coconut oil to a microwave safe bowl. Melt at 50% power for 45 seconds. Stir really well and continue to melt at 50% power in 20 second intervals until completely melted, stirring between heating each time. 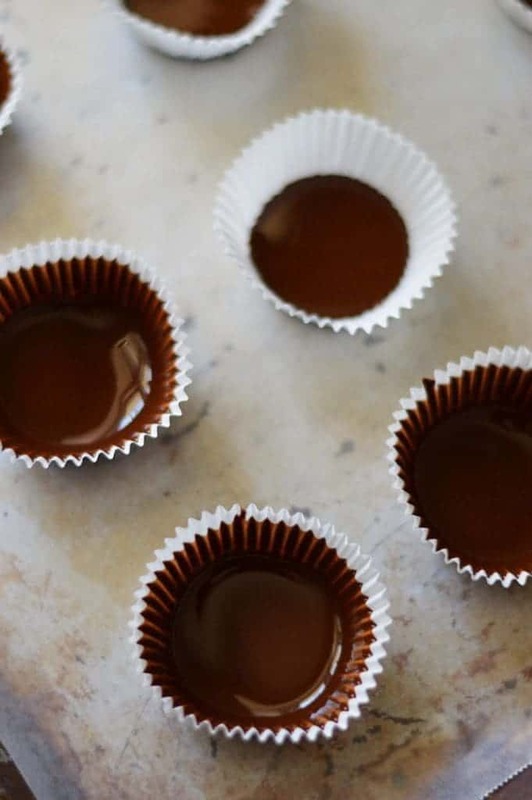 When the chocolate is melted, use a spoon to pour a little bit of chocolate into 24 paper mini cupcake liners. Pick up each liner after you add the chocolate and swirl the chocolate around the bottom and up the sides of the paper liner and then place on a baking sheet. When all 24 are done, place in the freezer for 15 minutes to harden the chocolate. 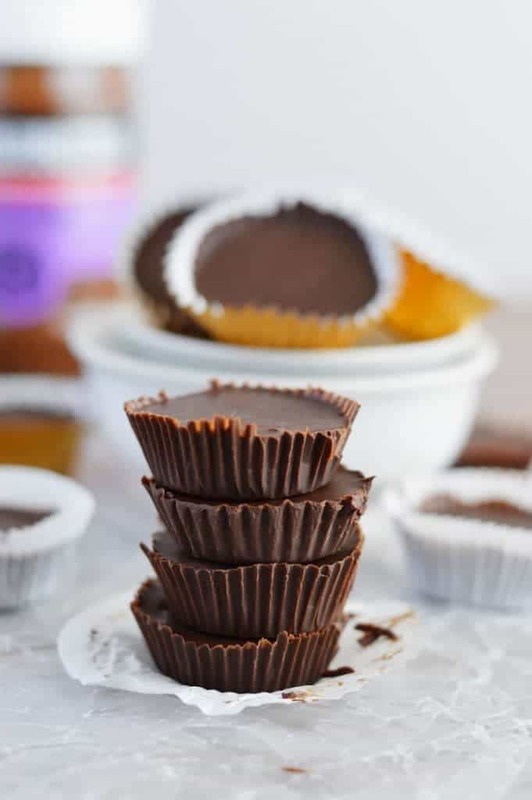 When the chocolate is set, fill the cups with the chocolate hazelnut paleonutbutter, divided evenly between the 24 cups. Use a spoon or your finger to flatten the paleonutbutter and then top each cup with the remaining chocolate. Place in the freezer for 15 minutes to set the chocolate. 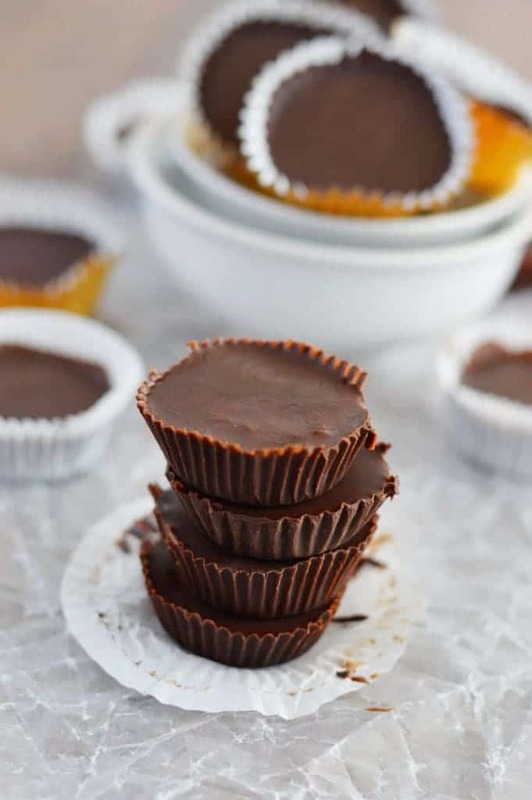 Once the chocolate is set, the chocolate hazelnut paleonutbutter cups can be stored in the refrigerator. Serve cold or bring to room temperature for a few minutes. I found that the Wilton brand mini cupcake liners worked best and peeled away from the cold chocolate without a problem. The thicker foil ones didn't peel away from the chocolate easily. These look amazing, Sharon! The perfect sweet bite to keep from over-indulging during the holidays. Or just on a generic Tuesday. These look so yummy, I’m gonna have to get my hands on that paleo nut butter! Yum!! What a great alternative to the unhealthy sweets that I am craving lately! Oooh! Thanks for linking to my fudge. 🙂 And I’ve never had their chocolate hazelnut paleonutbutter before. I so have to get my hands on some of that! These looks and sound fabulous! I love the addition of the coconut oil, too! You make it look so easy to make these! !